They were first imported into New Zealand in 1898, by Sir Heaton Rhodes, M.P. (Otahuna Stud) of Tai Tapu, Christchurch who brought a bull and three in-calf cows from England, on board the S.S. Tokomaru, arriving here on the 10th of March 1898. Further animals were imported by Rhodes in 1905, and then by M.H. Strachan of Kowhai Station in Gisborne in 1907 and 1912. 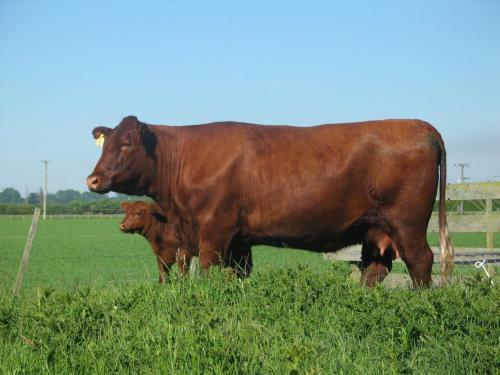 In England the Red Poll was often used for dairying although originally they were considered more as a dual purpose breed, which means that they produced both excellent milk and beef. 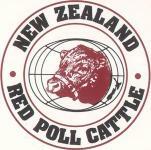 Red Polls are now used by commercial and pedigree breeders throughout the UK and overseas, especially in Australia, New Zealand, Canada, South Africa, Europe, Jamacia and the USA, to produce an excellent suckler cow with plenty of milk with which to rear a strong and healthy pure bred or cross bred calf.